Millions of undergraduate students will graduate in the next two months, and for some, that’s only half the battle. A plethora of soon-to-be grads are hoping to continue their academic pursuits by attending professional schools. And for those eyeing business schools, this means taking the Graduate Management Admissions Test (GMAT). Be sure to register for the test (online, by mail or fax), and prepare by finding the correct testing location to schedule your test. You can do this and access preparation materials, practice tests and diagnostic tools on www.MBA.com. And how exactly is the GMAT scored? 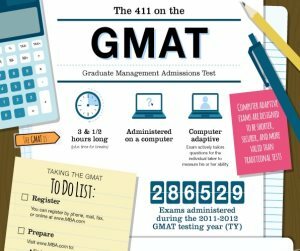 Every year about 20 percent of test takers retake the GMAT, and the average points gained for retakes is 33. The GMAT isn’t limited to the U.S. as 55 percent of test takers are from different countries.